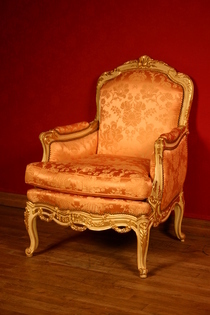 Louis XV style easy chair, solid beech wood, lacquered on skin glue with a copper leaf on the rim. Little flowers and leafage are carved with luxuriance. Copy after master woodworker Heurtault (museum of Copenhagen). Back and seat in traditional leaf fibre trimming on helical springs. Often covered with silk.